Garage and storage cabinet projects can't get any easier. 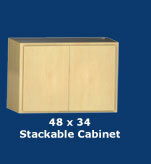 The Slide-Lok storage system consists of 10 storage cabinets and Slat-Wall. Each of Slide-Lok's garage storage products are designed to be mixed, matched and stacked with other Slide-Lok cabinets allowing you to create that perfect storage solution for any room in your home. accessories, flooring and other garage accessories. New options are also available such as a heavy duty metal storage chest and new extruded aluminum handles. Ask your authorized Slide-Lok dealer for more information.